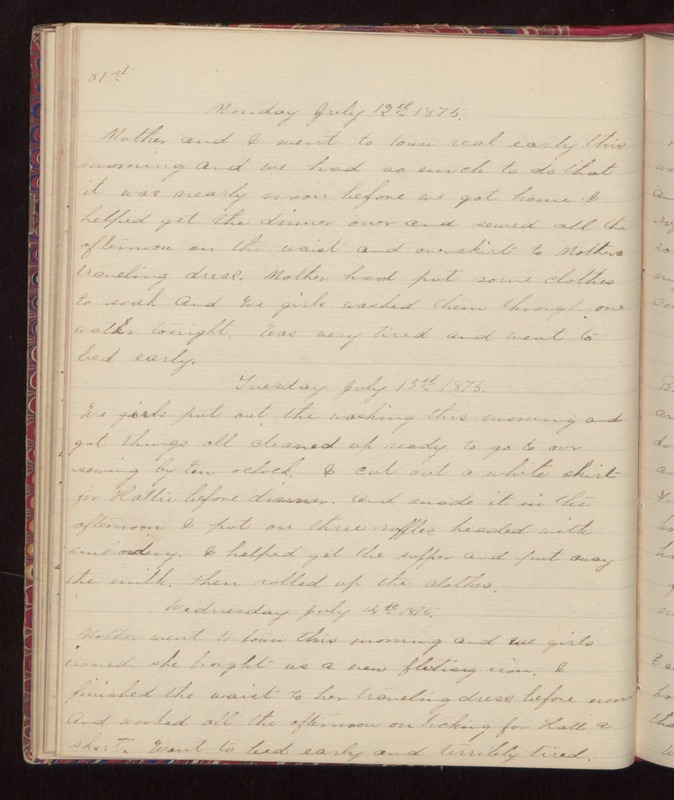 81st Monday July 12th 1875. Mother and I went to town real early this morning and we had so much to do that it was nearly noon before we got home. I helped get the dinner over and sewed all the afternoon on the waist and overskirt to Mothers traveling dress. Mother had put some clothes to soak and we girls washed them through one water tonight. Was very tired and went to bed early. Tuesday July 13th 1875. We girls put out the washing this morning and got things all cleaned up ready to go to our sewing by ten oclock. I cut out a white skirt for Hattie before dinner. And made it in the afternoon. I put on three ruffles headed with embroidery. I helped get the supper and put away the milk. Then rolled up the clothes. Wednesday July 12th 1875. Mother went to town this morning and we girls ironed. she brought us a new fluting iron. I finished the waist to her traveling dress before noon and worked all the afternoon on ticking for Hatts skirt. Went to bed early and terribly tired.